For home and small business customers, we recommend Power Manager. 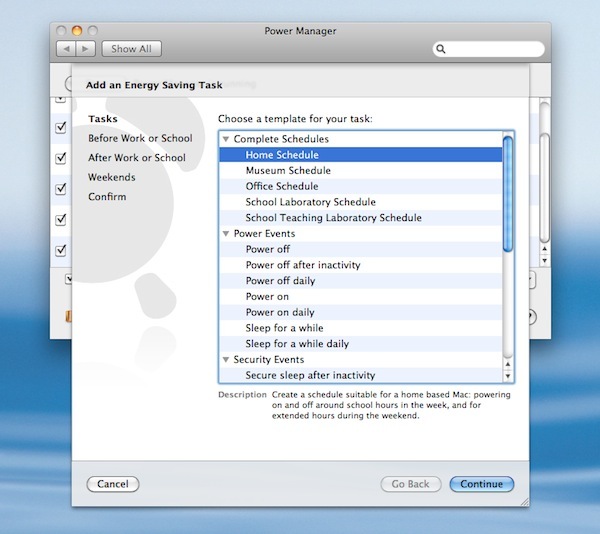 Power Manager includes a Schedule Assistant. The assistant provides a quick and easy way to create your own tailored energy saving schedule. Power on and power off your Mac at specific times. Launch applications, open documents, and run AppleScripts. Provide a better sleep after inactivity behaviour. Schedule back-ups to local hard disk drives. Put your Mac to sleep for short durations, such as over lunch. Power Manager 4 is available immediately. For families with a handful of Macs, a new Family Pack is now available. This article was posted in Energy saving, and Power Manager and tagged dssw, Power Manager, and Schedule Assistant.